The VueMinder icon will be displayed in the task tray, which is usually located near the lower-right corner of your screen, on the task bar. If you don't see the VueMinder icon in the task tray, the icon might be hidden. You can customize the task tray settings to always show the VueMinder icon. If the icon isn't displayed or hidden, then VueMinder probably isn't running. You can start VueMinder using the shortcut on the desktop or Start Menu. After starting VueMinder, its icon should appear in the task tray. By default, VueMinder will launch at system startup and will be minimized to the task tray. These settings can be modified in the Program Options. When the main window is minimized, VueMinder will continue to run in the background to ensure reminders are processed as needed. CPU utilization will usually be 0% while VueMinder is running in the background. This will occasionally increase while reminders are being processed or calendars are being synced. However, those operations take less than a second and you shouldn't notice any system slowdown while VueMinder is running. Memory use will vary. Since VueMinder is a .NET application, the memory reported by Task Manager may be higher than what you might expect. This is not because VueMinder actually requires the amount of indicated memory, but because of the way in which Windows and the .NET Framework allocate and cache memory for .NET applications. VueMinder can run on systems that only have 256 MB of RAM, so do not be concerned if you see memory allocation of 100 MB or more. This is just what Task Manager is reporting and not what VueMinder actually uses or needs. If other applications require the memory, Windows will reduce the amount of memory allocated to VueMinder. Conversely, the more memory is available and unused, the higher the allocation will be. 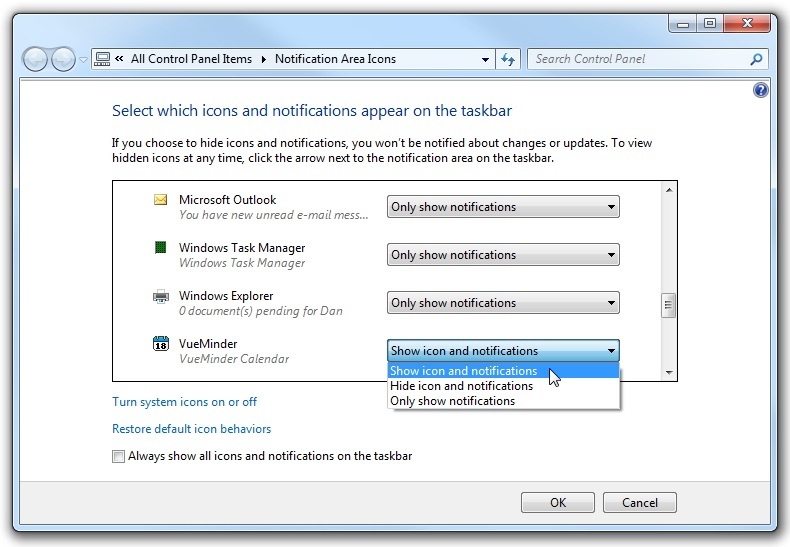 An icon will be displayed in the Task Tray (or Notification Area) of the Windows taskbar. The exact appearance will vary depending on your version of Windows. 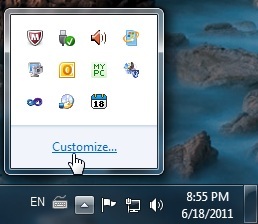 The example screenshots below show Windows 7 with an Aero theme. If you don't see the icon, click the arrow button in the task tray and select the "Customize" command. In the customization window, select "Show icon and notifications" for the "VueMinder" entry. When the mouse is hovered over the VueMinder icon in the task tray, a popup balloon show today's activities. The popup balloon will also appear after VueMinder is started. This option can be enabled or disabled in the Program Options. Double-clicking the icon will result in the main window appearing. Right clicking the icon will result in a context menu being displayed. The commands available in the context menu are described below. This will restore the display of the main window. Double-clicking the icon will do the same thing as selecting this menu option. A global keyboard shortcut can be assigned in the Program Options window. Regardless of what you're doing, the global hotkey can be used to quickly display the VueMinder window. 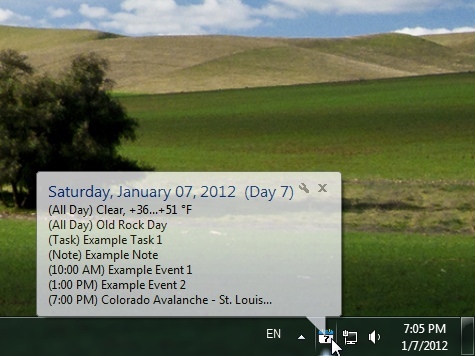 This toggles the display of the full-mode Desktop Calendar, an interactive, semi-transparent calendar that integrates into your Windows desktop background. As with the View Calendar command, a global keyboard shortcut can be assigned in the Program Options window. When enabled, the hotkey will minimize all open windows except for the Desktop Calendar. This toggles display of the mini Desktop Calendar. The mini desktop calendar takes much less space than the full-mode version. 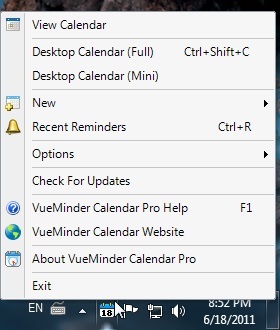 You can click the two Desktop Calendar options to toggle between full and mini modes. The New menu expands into a submenu of commands for creating new items. For detail about each submenu command, see the File menu documentation. The Options menu expands into a submenu of commands for adjusting VueMinder's options and settings. For detail about each submenu command, see the	Options menu documentation. This will open the VueMinder Updater window, which will check if you're using the latest version. If updates are available, a summary of recent changes will be displayed and you can choose to update VueMinder to the latest version. Version updates can include minor releases with bug corrections, or major releases with new features. If you choose to update, the VueMinder Updater will download the latest version, close VueMinder, and initiate installation of the update. Launches a browser window to display this help documentation. This will open the VueMinder website, https://www.vueminder.com. The VueMinder website provides many resources to help you get the most out of VueMinder, including community forums, blog articles, announcements, and more. This will display the Buy VueMinder window, where the program can be purchased. This will display the About VueMinder window, which replaces the Buy VueMinder window after the software has been successfully registered. This will fully exit and unload VueMinder. The program will no longer be running in the background if this option is selected. The VueMinder icon will be removed from the Task Tray. Any approaching events will not have reminders displayed or transmitted until the next time VueMinder is launched.